Today, I’m coming at ya with this AMAZING Rice Krispy Treat No Bake Cheesecake. And it’s a doozy! Summertime’s in full swing in Sacramento and to call it ‘sweltering’ would be an understatement. Girl, it’s HOT here. Like denim shorts fusing to your skin hot. Like sweating profusely on a morning walk hot. Like if you turn on the oven I’m going to scream at you hot. So no bake treats? We need them desperately. I’m on a mission to create as many no-bake treats as I can this summer to avoid turning on my oven as much as possible. Of course I’m still going to bake traditional goodies like cookies, regular cheesecakes and cupcakes, but I want to save those for days when I’m feeling ambitious and somewhat sadistic. Thus, this wonderful No-Bake Cheesecake was born! 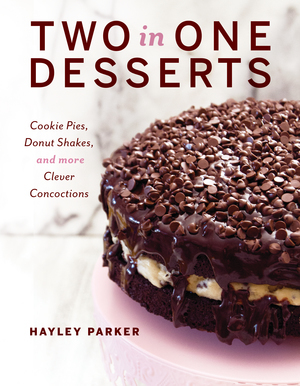 I have a very similar version in my new cookbook, Out of the Box Desserts, which comes out in August… or which should be arriving on your doorstep shortly if you ordered from QVC! The cheesecake base is the same, but the crusts and toppings are a little different. Whether you make my cookbook’s version or this version, promise me you’ll make one or the other – they’re simply too good not to enjoy! And everyone will flip out when they see that the crust is made out of a giant Rice Krispy Treat. I meeeeann… you are so welcome. Of course, this cheesecake is only for die-hard RKT fans like myself. If you’re not a superfan of the stuff, then you may want to pass. This is pure, unadulterated RKT goodness. So let’s break it down for ya. You make a standard batch of Rice Krispy Treats, except instead of pressing it into a square or rectangular pan, you’ll press it into a greased 9 or 10″ springform pan. Springform pans are also traditionally used for cheesecake, and it is necessary to help pop the crust out when it’s finished setting. Let the crust set in the pan for a couple minutes while you prepare the glorious marshmallow cheesecake filling. For the filling, simply beat together some cream cheese, sugar, and vanilla – standard stuff. Beat in some marshmallow creme (and try not to groan audibly) and then fold in some Cool Whip. Now, whenever I make a Cool Whip recipe, all you naysayers come out of the woodwork, but PLEASE, use real deal Cool Whip. Real whipped cream isn’t as stable as Cool Whip is, and your cheesecake won’t stay as high, fluffy and airy with anything other than Cool Whip. So yeah, blame science. Then, pour that wonderous marshmallow cheesecake goodness into your RKT crust. Garnish with whipped cream (there’s where you can use real-deal whipped cream) and plenty of stacked and cubed RKTs for garnish to really drive the point home that you mean business and are not to be messed with. And that’s that! Fluffy, light, airy, marshmallowy goodness that sits inside of a giant, gooey, crispy RKT crust. The end. This No Bake Rice Krispy Treat Cheesecake is phenomenal! Light, fluffy and packed with flavor, it's perfect for any and every die-hard RKT fan! Liberally grease a 9" or 10" springform pan with cooking spray. Set aside. Disclaimer: this post contains Amazon affiliate links. If a purchase is made using my link, I receive a small commission at no cost to you. Thank you for supporting the brands that keep my blog alive! This is SO stinking cute. Rice Krispy treat as a crust!! Why didn’t I think of that it seems so obviously brilliant!! And cheesecake come on my fave!! Giiiirl, I knew you’d love this one! This is SO much fun!!! I love Rice Krispie Treat Crust, I made a crust like this recently and it’s just perfect for no-bake recipes! Could I use powdered sugar instead of regular sugar? How about honey because I am diabetic? This is seriously genius, Hayley! It NEEDS to happen for one of our many summer birthdays!!! I agree! It’d be perfect for birthdays! I think this would be amazing frozen or substitute ice cream for cheesecake. Alberta, this would be wonderful with ice cream inside! Yes! But could also just use cool whip and a fruit flavored yogurt, mixed together in the center and frozen. I am definitely making this for my nephews when they visit next week. They are going to love it! I’ll be making it again at the end of July for a special birthday girl. After the initial 2 hour chilling period, does it need to be stored in the refrigerator? Because it has raw cream cheese and Cool Whip in it, yes, it does need to be stored in the fridge. The 2 hour chilling period just helps the cheesecake to set completely so it’s not a gloopy mess. Do the rice krispies get soggy after being refrigerated? Nope! They are nice and crisp. Do the rice krispies get too hard when they are refrigerated? Hi Carol! Not as much as you’d think! I feel like the cheesecake kind of helps keep them crisp and soft without being soggy. This may literally be heaven on a plate! I am a cheesecake addict! I can’t wait to give this one a try! Could I do this in a 9×13 if I don’t have spring form? Hi Kathleen! Do you have an 8×8 or 9×9 square pan? If so, I’d use that and line it with foil so it’s easy to remove – just prepare the recipe as normal. You *could* do it in a 9×13 pan, but you would want to make a little more Rice Krispies and a little more cheesecake… Approximately, one batch of the RKTs plus an additional 1/2 batch. For the cheesecake, you would then need 3 packages of cream cheese, 1 full cup of sugar, 2 (7 oz) jars of marshmallow fluff and 16 oz of Cool Whip to essentially double the cheesecake recipe so it wouldn’t be so thin when spread in a 9×13 pan. Hope this helps! If one batch of cheesecake takes 1-8oz cream cheese then why would doubling it take 3? I am making this for Monday . I am going to use a 9×13 with just the regular recipe of rice krispie crust but I am going to double the filling. Hi Wendy! So Cool Whip is a very stabilized whipped cream-like product. In its place, you can substitute 2 cups of whipped cream! As for the marshmallow fluff, do you have marshmallows there? It’s essentially melted and smooth marshmallow spread. If you have marshmallow there, melt some marshmallows until smooth, let them cool for a few minutes, and add in the melted marshmallows. Hope this helps! Was just going to ask same question as in the UK thank you. Ian, thanks for your suggestion about finding the marshmallow fluff! As far as a Cool Whip substitute, if you can’t find stabilized whipped cream, use regular whipped cream. 1 (8 oz) package of Cool Whip equals 2 cups. Does anyone know if you can use Philadelphia already made cheese cake mix. I don’t have a beater. Hi Julie! I have not tried this recipe with prepared cheesecake mix so I can’t say for sure. If it has eggs in it, I wouldn’t use it as this is a no-bake cheesecake. However, if it doesn’t, I’d omit the sugar if the cheesecake mix is sweetened and use as directed. Hope it turns out for you! Philadelphia Cheesecake filling says ready to eat, no cooking involved. I am going to try this with the ready made filling for a dessert auction next week. I wish I had thought of this. The only thing I did was make Bologna bowls and filled them with scrambled eggs and cheese. (Just put a whole slice of Bologna in a frying pan,let it cook for a couple of minutes, then turn it over and finish cooking it. Carefully put your Bologna bowls on a plate or in a cereal bowl and fill it with the eggs and cheese. Kids will love this. Can you use already made Philadelphia cheesecake? Julie, I have not tried using the prepared cheesecake. If you do use it, I would omit the sugar since the cheesecake mix usually comes pre-sweetened. Just make sure there are no egg products in the cheesecake mix – if there are, it could be unsafe to eat. Has anyone tried using chocolate hazelnut spread instead of marshmallow fluff? That would be amazing, Tiffany! I added Nutella to cheesecake mix along with amaretto! I made this for the 4th of July with the Red White and Blue Rice Krispies. It was so festive and yummy! How fun! 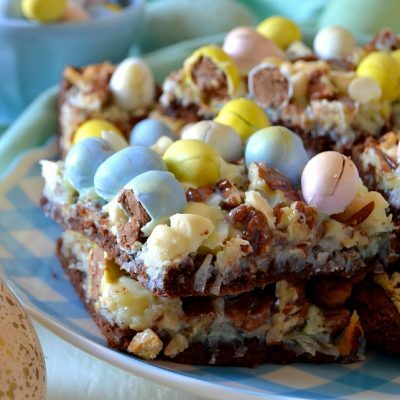 I love the idea of using the colored Krispies! I am definitely making this for the next party I go to–and the crust possibilities?! Adding peanut butter or using fruity pebbles….this could be a new party favorite for sure! I love your ideas for crusts! I’m making a Fruity Pebble one soon! I am gluten intolerant so I am always looking for a pie crust. I can’t use Rice Krispy brand because of the malt but I can use Cocoa Pebbles or Fruity Pebbles. Thanks for the ideas!! That was fantastic!!!! Especially during the hot days… Such a perfect treat!! Love it!!!!! So glad you loved it, Kelli!! xoxo!! This is so cute! I’m making it now. I don’t know when I’m supposed to remove the cheesecake from the spingform pan. Anyone? Hi Dianne! Once the cheesecake is assembled in the pan, leave it in there for about an hour or so to set up, then gently release it from the pan. Hope this helps! Sharon, I recommend using a springform pan to ensure the cheesecake is easy to cut. You can try using a really-well greased 9″ round cake pan, but I have not tested this cheesecake recipe in that type of pan. I wonder if you could make chocolate RKT crust. If so what would the recipe be for that? Kat, absolutely! 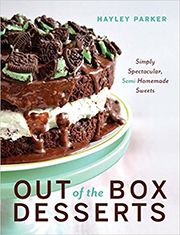 I have a recipe for that in my new cookbook, Out of the Box Desserts! Which recipe in the book uses the chocolate rkt crust? Hi Anne – in my first book, Out of the Box Desserts, it’s the toasted marshmallow cheesecake recipe! Ps-I just ordered the book! Do you think this would work as RKT cheesecake bars? Do you think the cheesecake filling would hold together if I make a RKT crust on the bottom of a 9×13 pan and then topped with the filling, chilled, and cut into bars? Will it be okay if made the day before or does it need to be made day of for best results? Hi Meg! I think it should be okay to make the day before. The crust may not be as crisp as if it would be made the day of. Sorry didnt mean to post twice, I didnt see that my first one went through! Thank you so very much 🙂 excited to make this for tomorrow to celebrate an anniversary with my boyfriend! Can I prep it a day before serving or is it best day of? Hello! I’m using a larger springform pan (I believe it’s 12-13″) — how much should I add to the ingredient amounts? I’d hate to wind up with a thin cheesecake! Hi Amber! Sorry I’m seeing this now, but you may want to double the crust and filling to be safe! Do you think I culd make this 2 days in advance and it still taste fresh? Hi Amanda, I would make it the day of or if needed, the day before. I’d worry that the crust would lose its crispness. Probably a silly question, but it looks like this is gluten-free…is it? We have a friend who is allergic to gluten and this looks like it might be an awesome dessert for him. Hi Julia! Not a silly question! I think this could easily be made GF if it isn’t already. For starters, make sure the cereal and marshmallows are GF. I’m pretty sure they are, but I would double check on the packages, as I would with the rest of the ingredients. Hope this helps! I am gluten intolerant. Last time I checked Rice Krispy brand is not gluten free because of the malt flavoring they put in it. Cocoa Pebbles & Fruity Pebbles are gluten free. Kim, so so happy to hear how much of a hit it was with your boyfriend, nieces and nephews! Ok so my god daughter sent me a pic on fb and asked me to try it ,.. I did … I just finished and my question is when do it release it from the pan.,.2 hours? Hi Ann! Yes, give it a couple hours to set in the fridge! The recipe is super easy. It doesn’t take 2 hours and 30 minutes to make. At the most it takes 25 minutes to prep and if you want it nice and cold refrigerate for 4 hours. We found this recipe to be too sweet so we modified it and it came out perfectly. This recipe is a great idea for birthdays or events or just for a special treat on a hot day. Would this work with a non dairy cream cheese ? I have not tried that, but I assume so! Hi ! Would this work for a non dairy cream cheese ? If you add gelatin to the whipped cream, it stays just as stable as the cool whip. That’s what we do in industrial kitchens. That’s why all those fancy little dollops don’t break. I personally would rather do the extra step. I just made this for a party tonight. If was easy to make but I feel the filling is way too sweet. I would make it again and not use all the sugar. Thank you for the idea! This was very delicious. Great recipe thank you for sharing. It made a great birthday cake for someone who loves cheesecake. How long does this stay good for in the fridge? Would Dream Whip possibly work instead of Cool Whip? I’m pretty sure it’s more stable than regular whipped cream, but tastes better than Cool Whip, since it’s made with real dairy. Hi Jeanine, I would imagine it would work! When do you take it out of the pan? Hi Tosha, you’ll want to wait until it’s fully set – 2 hours should be fine! Hi Sierra! That just means do not use an electric mixer for this. You want to fold the Cool Whip in gently so it doesn’t start to deflate. A mixer could be too intense and cause the whipped topping to lose its height. Hope that helps! The recipe is awesome. But the sugar intake alone is crazy. (I made this tonight) I have such a sugar rush right now. I might need to do a few adjustments. But over all. I love the RKT’s for the crust. I made this for s party and it was s big hit! Instead of rice crispy treats on top, I put lemon curd and then decorated with fresh whipped cream…so yummy. Hi Sheila! Love the idea of the lemon curd!! I used brown sugar, added tsp of pumpkin spice, you end up with pumpkin pie look and taste for Thanksgiving. awesome.